A nine-year-old boy in Sengattur Panchayat Primary School, Salem district, with mild stains on his teeth. Nine-year-old Uday and 10-year-old Keerthika are students of the fifth grade at the panchayat primary school in Sengattur village of Ayothipattinam block in Salem district. Cheerful and full of joy, these children unmindfully reveal the strikingly yellow stain marks on their teeth as they smile. Born to daily wage labourers, the kids are among a bunch of 35 students who seem happy now, but are destined to a life of illness. Just behind their school is a narrow street lined up mostly by single-room dwellings built during late Chief Minister MGR’s first tenure. Seated at the doorstep of the houses are elder members of the village, whiling away their time, even as the younger members of the family are either engaged in household chores or are working at the fields of local landowners. Among these toilers is 21-year-old Selvarani, who works at an arecanut farm. Her hair is tied tight with a towel to prevent it from falling on her face while working. But she has no such protection to cover her brown-stained teeth. She is shy, nevertheless she is open to engaging with curious visitors. She reveals that she is a student of M.Com at the Sheveroys College of Arts and Science located at Vazhavandhi, a tribal village atop the Sheveroy hills that overlooks her village. She is forced to combine study and work to supplement her family’s income as her parents are daily wage earners. She also wants to earn a few more bucks to spend on her own little likes. She dreams of having a decent career and marrying an educated man. But with the striking stain marks on her teeth, she feels she is unlikely to get married to the men she desires. Her colleague Sangeetha could only complete middle school and had to marry a close relative within the village after being spurned by men outside the village. Sellamma, one of the elders whiling the day away, says she can’t turn her neck and has continuous pain on her joints. “I can’t even make it to the Primary Health Centre in the next village (about 2 kilometres away) to get treatment. When the pain is too unbearable, I swallow some pills my son gives,” she says. On seeing us quizzing the women, 58-year-old Ezhumalai walks towards us with great effort. The man has a permanent hunch back and his two knees knock as he walks. Expressing a strong will to work and earn his living, he says he was a tough estate worker once, but now no one cares to engage him and he depends on what his only son provides and on the subsidised supplies from the government ration shop. These people are the flesh and blood behind the statistics of India’s water-insecure habitations. They are among the victims of skeletal, non-skeletal or dental fluorosis living in the fluoride-hit, drought-prone districts of Salem, Dharmapuri and Krishnagiri. Fluoride is an acute toxin, one of the most bone-seeking elements. Daily ingestion of just 2 milligram (mg) of fluoride could result in crippling skeletal fluorosis after 40 years. Excess fluoride causes several diseases, like osteoporosis, arthritis, brittle bones, cancer, and infertility in women, brain damage, Alzheimer’s disease and thyroid disorders. The very nature of fluoride increases this danger manifold. Almost half of each day’s fluoride intake is retained and is absorbed by the bones and teeth. The fluoride content of the water in Sengattur village borewell, which people are forced to consume for drinking and cooking, is between 1.8 and 2 ml/litre, as against India’s drinking water standard’s permissible limit of 1.5 ml/litre. 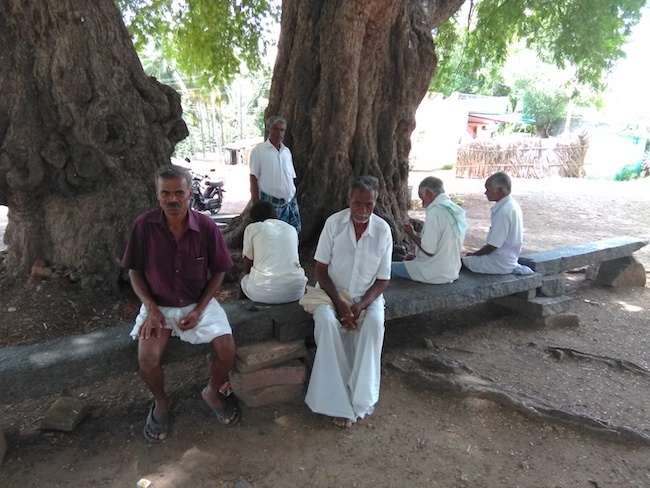 In village after village on the Salem-Vellore state highway and in the hamlets tucked away along the Sitheri and Sheveroy hills flanking both sides of the stretch known now as ‘fluoride belt of Tamil Nadu’, one can find people with similar illnesses. These villages look idyllic and calm, with fresh mountain air providing a day-long cool temperature. It is this green belt over which the Chennai-Salem Eight Lane Green Corridor Express Highway is proposed to be laid. A majority of inhabitants of these villages belong to the Scheduled Tribes (ST) , Scheduled Castes (SC) or the Most Backward Classes (MBC). Ten of Tamil Nadu’s districts have a total of 250 habitations affected by endemic fluoride, according to Fluoride Alert, of which Salem has 25 habitations, Krishnagiri has 43. Dharmapuri is the fluoride capital of the state with 141 habitations. It is an irony that while the Cauvery flows through these districts, thousands of people in the rural areas cannot have it to quench their thirst or to cook food. According to C Selvaraj, Secretary of the Association for Welfare of Agriculture and Rural Development (AWARD), Dharmapuri – which partnered as an NGO in the Hogenakkal Integrated Drinking Water Project Flouride Mitigation Component – people here are dependent on groundwater drawn from community borewells with high fluoride levels because the promised Cauvery river water does not reach the villages. Across Tamil Nadu’s North Western Districts, from Salem through Vellore, straddled by the discontinuous range of Eastern Ghat hills, fluoride leaches into groundwater through mineral-bearing old Charnockite rocks and granitic rocks. The fluoride content in groundwater ranges between 0.4 and 6 ml/l, according to a study supported by the TN Water Supply and Drainage Board’s (TWADB) data. Proven long-term measures to mitigate the fluoride contamination exist, none of them are being tried in TN, nor has any short-term intervention been undertaken at the community level, although several options are proposed. The TWAD doesn’t hide facts about the high levels of fluoride in hundreds of habitations in this part of the state. For its officials, fluoride contamination is a pretty old story, with a happy ending of “100 per cent coverage” of treated Cauvery river water supply through its dozens of Combined Water Supply Scheme (CWSS). But that’s far from reality. People say that they hardly get Cauvery water for two days a month, forcing them to depend on mini power pumps and community borewell water, contaminated with fluoride, pumped to the village tank. Safe drinking water supply is irregular, and four-fifths of the rural population are cut off from the piped drinking-water network. In villages, we find that drinking water pipes are laid only along the main roads and individual connections are given only to a few dozen houses and shops in the main village. Interior habitations have only public taps. This demand-supply gap is alarmingly wide, according to the villagers. Government and non-government interventions for fluoride mitigation were hectic in the early 1990s in Salem district, ending with the supply of Cauvery river water for the habitations. Water deficit areas including the fluoride affected villages were covered through Combined Water Supply Scheme (CWSS) between 2009 to 2015. As many as 10 water schemes with Cauvery as the source are under operation currently in Salem District. The rural water division was able to reduce the demand-supply gap with the completion of exclusive drinking water scheme for Salem city during 2011-16. Two new schemes are currently underway to ramp up coverage in the rural belt of the western part of the district, including the Chief Minister’s constituency Edappadi. In all, the 10 CWSS’s serve 33,41,600 people in 4,550 habitations in Salem District, which includes 385 Panchayats and 4 Municipalities. According to data provided by TWADB‘s Superintending Engineer (In-charge) P Rajenderan, the 10 CWSS’s are designed to serve a quantity of 173.260 million litres a day (mld) and a supply of 173.59 mld is being achieved. In addition to CWSS sources, the villages in Salem boast of a total of 6,365 hand pumps, 6,187 power pumps, 5,031 mini power pumps, 6,384 overhead tanks and 167 Ground Level Reservoirs (GLRs). In the neighbouring Dharmapuri and Krishnagiri districts, fluorosis was high till recent years and mitigation efforts started late in 2008, with the launch of the Hogenakkal Integrated Drinking Water Project by TWADB. The Rs 13.34 billion project envisages water supply to 40,40,000 people in the two fluorosis-affected districts. According to the fluoride mitigation awareness bulletin, before the project initiation, more than 52% of the habitations were affected by high concentration of fluoride in groundwater (56% of Dharmapuri and 48% of Krishnagiri, including towns and villages). Out of the 10,451 handpump sources, 3,161 were found highly fluoride contaminated. Eighty per cent of the people in the rural side were affected by dental fluorosis and 20% were affected by skeletal fluorosis. Many among the affected people have lost their ability to earn a livelihood and were overcome by poverty. As many as 45 NGOs are engaged under the Fluoride Mitigation Component of the Hogenakkal Integrated Water Project (completed in the year 2014), which was carried out with assistance from Japan International Cooperation Agency (JICA) in Dharmapuri and Krishnagiri. The emphasis was on providing people a safe alternative to fluoride contaminated water and on extensive awareness programme about fluorosis and the need to consume safe water. Making the project holistic, the Health and Education departments partnered in the mitigation programme. Yet, four years after the official completion of the fluoride mitigation efforts, there is a long way ahead to get anywhere near NITI Aayog Chairman Amitabh Kant’s belief, stated in the Composite Water Index report, that the objective of ‘Sabka Saath, Sabka Vikas’ can be fully achieved once the benefits of the interventions reach the last mile. This is Part 1 in a series. Read Part 2 and 3 of the series here.